We wish you a very Happy New Year and all Good Wishes for 2011. How to condense a whole model year into a readable piece? Impossible without filling half of Wikipedia! So here’s quickie scoot through five items that entertained us, big and small... In February we clomped through the last of the winter snow to a Collector Fair near Oxford, UK. 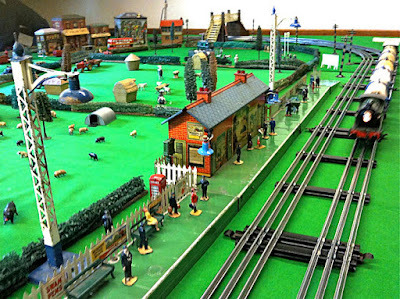 There were the usual stalls sprinkled with tempting treats, but star of the show was the splendid O-gauge three-rail electric layout. Of course, items like this are hardly ‘true scale’ - they are (or were) a half-way point between a non-scale ‘toy’ and a true-scale ‘model’ - but you can enjoy them for what they are - immensely pleasurable objects that also have the benefit of action, controllability, and in Kidlington anyway: lots of lovely clickety-clack noise! The trackside accessories were a joy to behold - for example, many of the buildings were re-used decorative biscuit tins, and very fine they looked too. The station was a piece of original tinplate railwayana, and looked terrific, as did the tin platform, even if it was sleek and shiny, unlike the real thing. All in all, marvellous stuff. In March we fell for Tamiya’s delightful 1:48 scale Komatsu bulldozer kit. When assembled, it’s a dinky little thing, just 75 mm (2.9 in) long, but the detail is oh-so-fine, with components such as hydraulic lines, front grille, suspension system and, of course the ’dozer blade, all well reproduced. A pity perhaps that Tamiya decided to mould the tracks as one-piece non-moving plastic parts, but the box contained a decent driver figure, who manages to grip the steering controls realistically. An unusually handsome feature at the front was the grille badge, included as a metallized decal. Come April, we were in Stratford-upon-Avon, home of William Shakespeare, and nowadays Much Ado About Toys (MAAT), a treasure trove of miniature delights that range from plastic kits to tinplate collectibles. Schylling’s tinplate products were well represented at MAAT. These are modern takes on nostalgic and retro themes; for example, the palm-sized ‘King Jet’, just the sort of thing I’d like as an alternative to my usual economy-class airline ticket! MAAT’s collection of CIC diecasts from France had attractive retro lines, with offerings like a Renault Camionette or a one-off Watermans Ink promotion vehicle from the 1950s. At the UK’s Farnborough International Airshow in July, there were plenty of models on display, both in the trade halls, and for sale in exhibition tents out in the sunshine. Trade hall models came large and small, and were fascinating for their variety, from rockets to rotorcraft. Models for sale showed just how popular readybuilts have become - it was almost a clean-sweep for them, with only a few construction kits on display. The incredible levels of detail now going into metal kits impressed us - a Sukhoi Su-27 had amazingly fine panel detail, while a Hobby Master Douglas Skyraider had a jewel-like sliding canopy, and a complete range of ordnance slotted neatly into a shiny plastic case, waiting to be hung under those straight wings. Totally ace. 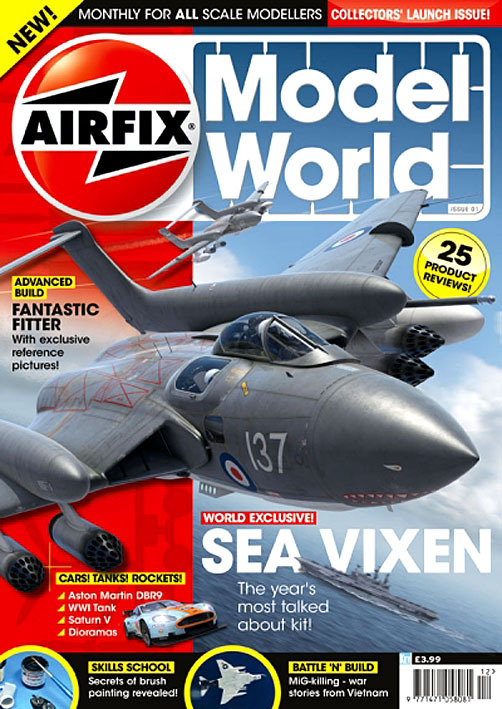 November saw the return of an old friend, Airfix magazine, this time packed with colour, a bigger format, new name, and a new publisher. Content in the launch issue was wide-ranging, leading with the just-released Airfix 1:48 scale Sea Vixen kit, with detail shots that included the neatly-modelled observer’s cockpit and radarscope. Backed up by other features, the new mag made a strong start - and of course, with a ‘Space Build’ feature by SMN’s own Mat Irvine, it had definite class on its side! 1 Kidlington’s O-gauge tinplate trains. 2 Tamiya 1:48 scale bulldozer, with Zero fighter behind. 3 Tinplate King Jet at MAAT. 4 CIC Renault van to 1:43 scale. 5 Pakistani JF-17 Thunder jet fighter model on display at Farnborough. 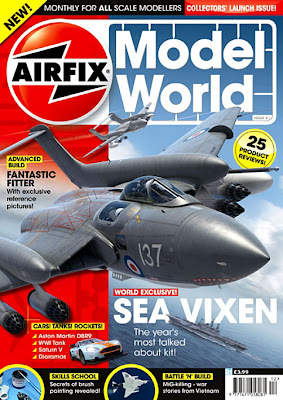 6 Airfix Model World magazine launch issue, November 2010. 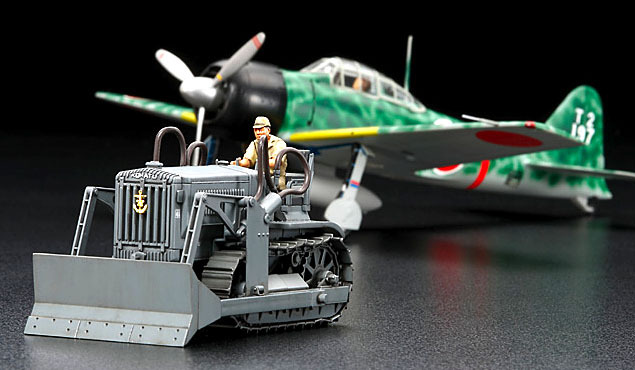 Pictures Scale Model News, except Komatsu Bulldozer courtesy Tamiya. As we enter the Christmas season, we can all look forward to 2011 which, if model world rumors even come partly true, promises to be a very eventful year! Thank you for visiting Scale Model News throughout 2010 and we look forward to your company in times to come. We are also looking forward to launching some major improvements to Scale Model News. So stay tuned! As for the pix above, well wouldn’t we like to make a kit of that Jules Verne Nautilus lookalike?! Sad to say, there isn’t one quite like it available, so it’s here as an Xmas-week project idea for you kit-bashers out there. Have a look at some Hawks (and not just the BAe kind) here. The Douglas DC-3 flew for the first time on December 17, 1935, 32 years after the Wright brothers made their epic first heavier-than-air flight in the biplane Flyer over Kill Devil Hill in North Carolina. The all-metal DC-3 was a design step on from earlier Douglas Commercial designs, the DC-1 and DC-2, though it looked very similar. Two Pratt & Whitney radial engines allowed the DC-3 to carry 21 passengers up to 2382 km (1,480 miles) at some 313 km/h (195 mph). The range and speed allowed an eastbound flight across the US to be made in some 15 hours - by far the fastest time for a commercial flight. The DC-3 was a runaway success and had a decades-long manufacturing life, with more than 10,000 being built as C-47 military transports during World War II. 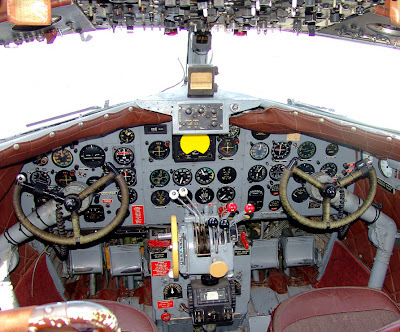 There are plenty of DC-3s still flying today, though we can't find a reliable source for an exact number. For the Douglas-Commercial fan, there’s choice aplenty out there, in all sorts of scales. Whether it’s diecast or plastic kit, there’s something to please. 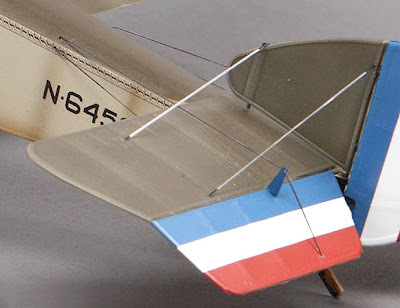 For something exotic and different, the Guillow’s see-through balsa model to 1:32 scale makes an interesting choice. It’s a biggie though, with a wingspan nearly a metre wide. At the other end of the scale, the tiny 1:500 scale Herpa DC-3 is something small enough for any desktop. 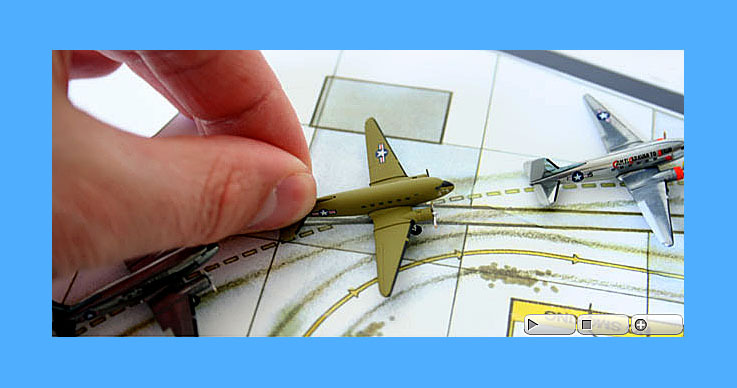 The Berlin Airlift Scenix edition offers a trio of 1949 DC-3s, complete with a mini-diorama of Templehof Airport. The transparent box includes sound effects in German, but sorry, we don’t know what the script is! 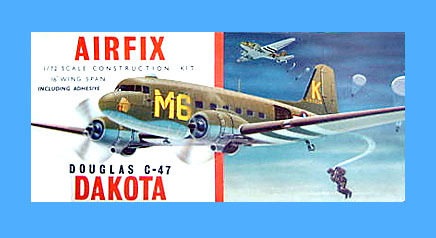 The Dakota Association of South Africa has a terrific (if somewhat slow-loading) page, in which many kits are listed. It’s fascinating stuff, and you can visit the listing here. 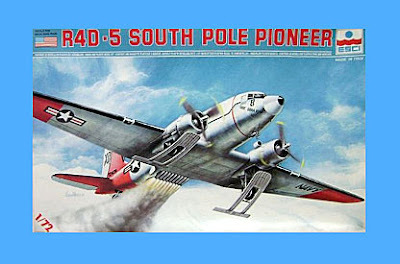 See DC-3 kits and stuff here. 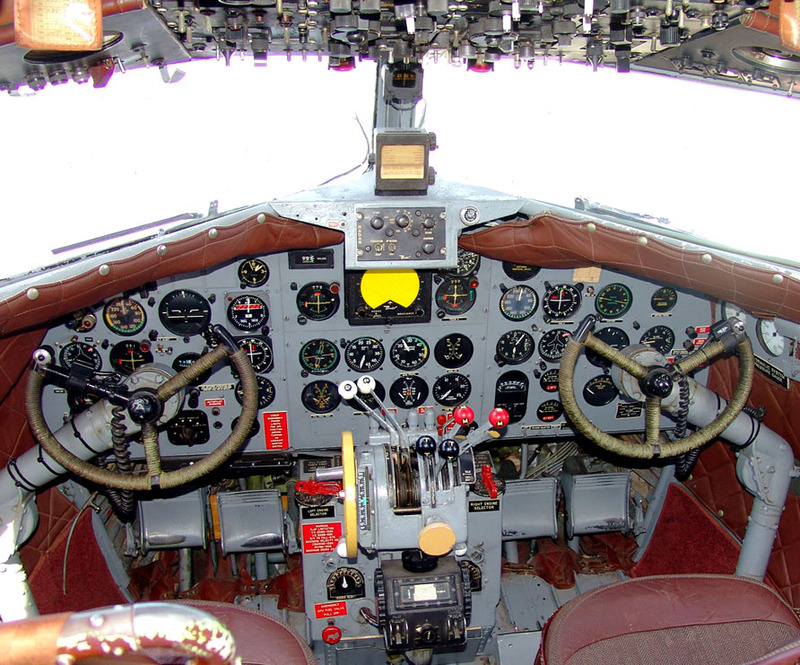 Inspect Guillow’s balsa DC-3 here. Visit the Herpa Berlin Airlift here. 1 Airfix 1:72 scale original box. 2 Esci R4D with skis 1:72 scale. 3 Guillows balsa kit 1:32 scale. 4 Herpa models 1:500 scale. 5 Monogram with paratroopers 1:90 scale. 6 Flight deck of the real thing. 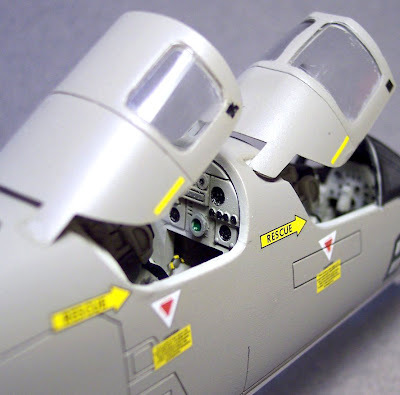 A fascinating new Airfix release for the New Year will be a modded 1:72 scale BAC TSR2. This is the ‘TSR.2MS’, a rocket-boosted, missile-equipped aircraft designed to home in on and destroy incoming space rocks headed for planet Earth. Well now, NASA hasn’t suddenly issued a world-wide doomwatch alert - in fact, the TSR.2MS is one of the machines that feature in a Japanese anime (cartoon) called 'Stratos 4', a sci-fi series that’s set in the near future, around 2024. Scientists have spotted a group of comets on collision course with our world, and to answer the threat, global defences include the space-based Comet Blasters, and the ground-based Meteor Sweepers (the 'MS' of TSR.2MS). The action is based mostly on Shimoji Island off Japan, where heroine Mikaze and her friends are last-ditch defenders of the planet. Ooer! 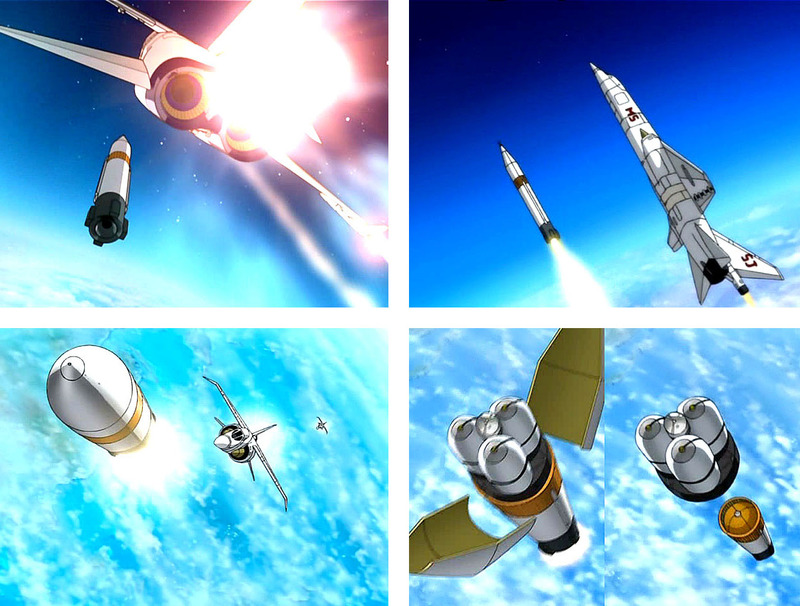 But weirdly, Stratos 4’s creators decided to modify various aircraft from the 1950s, ’60s and ’70s as anime machine stars. Still, not for us to ask the reason why - after all, why NOT have a Caravelle twin-jet to fly to a party?! The TSR.2MS is the main interceptor, and it makes a really interesting ‘what-if’ design - after all, the anti-comet missile could just as easily be a Blue Steel standoff weapon, and the tail rocket could have been lifted from a Saunders-Roe SR.53! 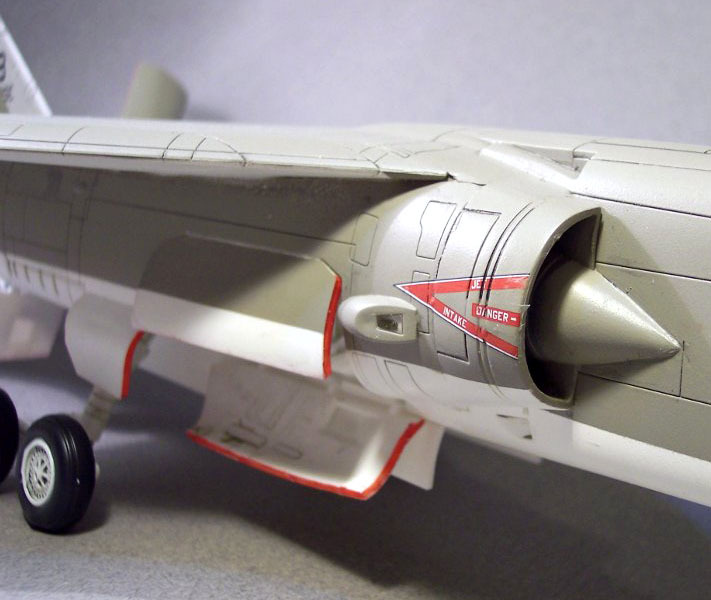 And talking of ‘what-if’ TSR2s, there’s an ace build of the larger 1:48 Airfix kit by Jon Bius, over at Agape Models. This kit has been finished to match markings sported by that oh-so-elegant US Navy jet, the RA-5 Vigilante, one that was based on the USS Enterprise in 1975. The TSR2 and Vigilante are not that dissimilar, in both looks and top speed, so the markings transfer across very well indeed. All of which sounds fine to us - appearance is really what counts in a what-if build like this. Well crafted Jon - it looks a really neat model. Airfix has a competition going on the TSR.2MS kit here. Visit Agape Models for lots more pix and info here. Find some TSR2 stuff here. 1-2 TSR.2MS box, plus missile launch sequence. 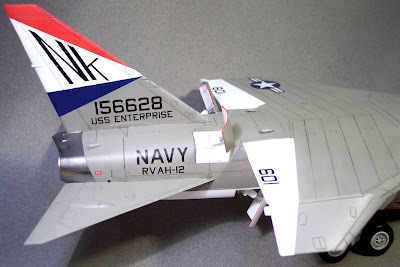 3-6 The what-if TSR2 built in USN markings by Jon Bius of Agape Models. Congrats to SpaceX for the successful up-and-down flight of the Dragon space capsule. 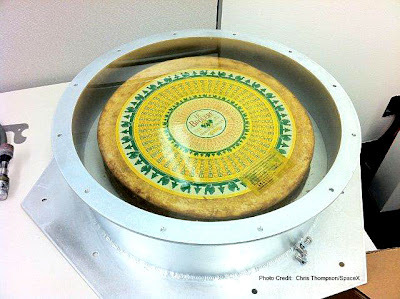 And for telling us about the el neato 'secret cargo' it carried into space and back - a round of cheese, decorated with a wellie-wearing cow picture... 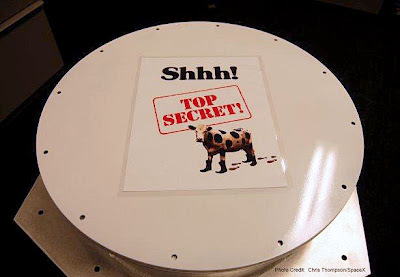 mooo!! Apparently it was a tribute to Monty Python, though that's a sketch we missed here at SMN Towers. Thanks to: Karl Tate of Space.com for the cutaway graphic, and Chris Thompson of SpaceX for the cheese pictures. Visit Space.com here and SpaceX here. DRAGON SPACECRAFT RETURNS FROM ORBIT! 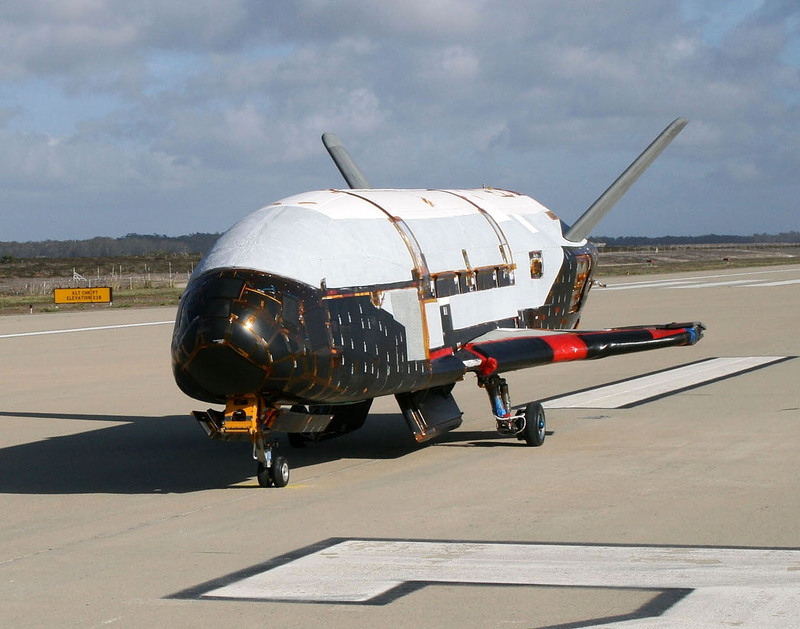 X-37B LANDS ON RUNWAY! News that the US company SpaceX successfully test-flew its Dragon space capsule today makes SMN really proud - for this company is in the vanguard of the privatization of space. Along with the likes of Sir Richard Branson’s Virgin Galactic program, it looks as if there might be a future for rocketry in the post-Space Shuttle era after all. And talking of Dragons, the Chinese model company of the same name is busy releasing a miniature ‘Space Collection’, to 1:72 and 1:400 scale, plus 1:6 scale astronaut figures. The spacecraft are all ready-built, mixing diecast metal with injection-plastic parts, and while some are familiar subjects - Apollo and Shuttle feature strongly - there is at least one really interesting of-the-moment release, and that’s the 1:72 scale X-37B OTV (Orbital Test Vehicle). Looking much like a mini-Shuttle (and originally designed to fit inside a Space Shuttle cargo bay) NASA’s X-37B program was taken over by the US Department of Defense in 2004. The craft saw its first orbital flight on April 22 this year, and stayed aloft on a secret mission until returning just last week, on December 3. The X-37B is a completely automated winged vehicle that lands on a runway like the Space Shutttle. The Dragon X-37B is a neat piece of model engineering that sits on a stylish stand. However, it’s interesting to compare the smooth and sleek lines of the 1:72 scale model with the lumps, bumps, and varying textures of the real thing, as seen in the official pictures above. And look at those white protective suits - the engineer-techs look for all the world like extras from a Hollywood sci-fi blockbuster - Close Encounters anyone?! 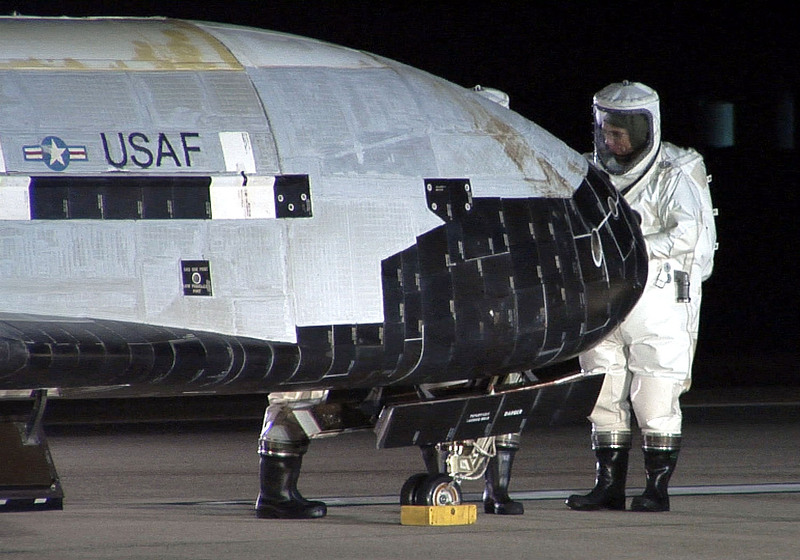 Well done Dragon for this X-37B - it’s an unusual subject that’s been well captured. Let’s hope the company will provide a 1:72 scale Dragon capsule soon, preferably with a seven-astronaut crew inside! We’ll be showing a neat diagram of the Dragon capsule and other spacecraft in the next day or two - keep your eyes peeled for that. 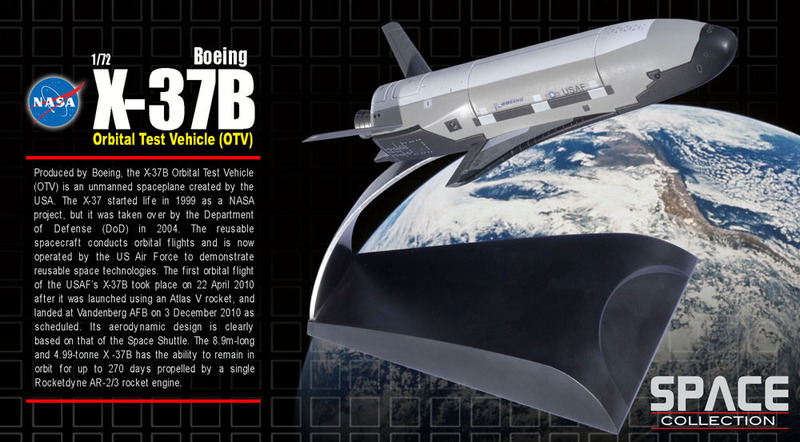 1 X-37B 1:72 scale model from Dragon. 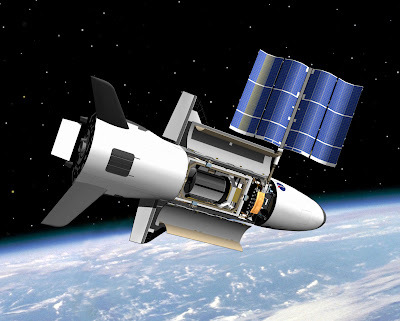 2 CGI of the X-37B in orbit, with solar panels extended. 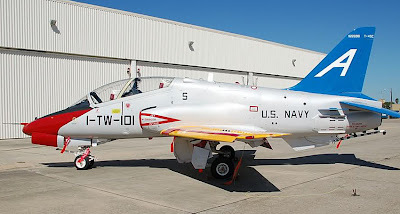 3 X-37B post-flight on the runway. 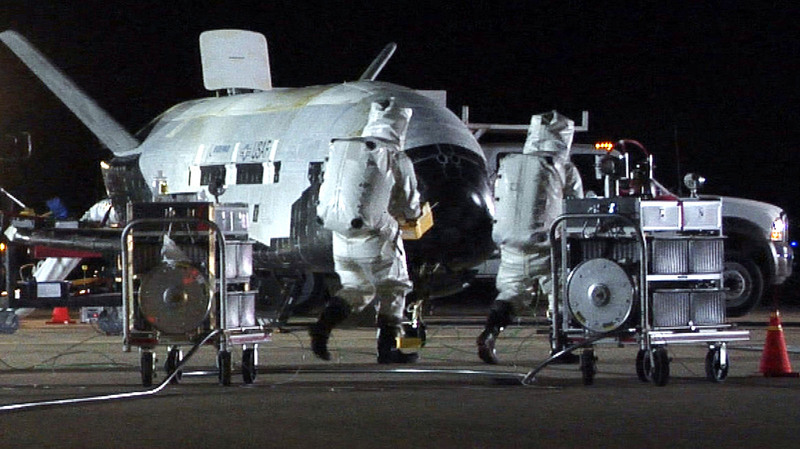 4-5 Technicians fettle the X-37B after its seven-month-plus mission. For lovers of World War I and big-scale aircraft models, here’s a gorgeous 1:32 scale kit from Wingnut Wings, the Sopwith Scout, or ‘Pup’, a single-seater that was much loved by its pilots. 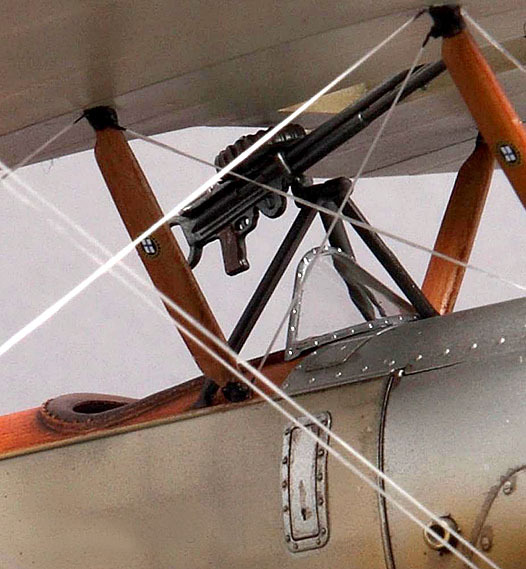 Some 2100 Pups were built during the Great War, and the Wingnut model builds into a very neat representation indeed. The box features handsome art on the cover, while inside there are 128 injection-moulded plastic components and six photo-etch metal detail parts. 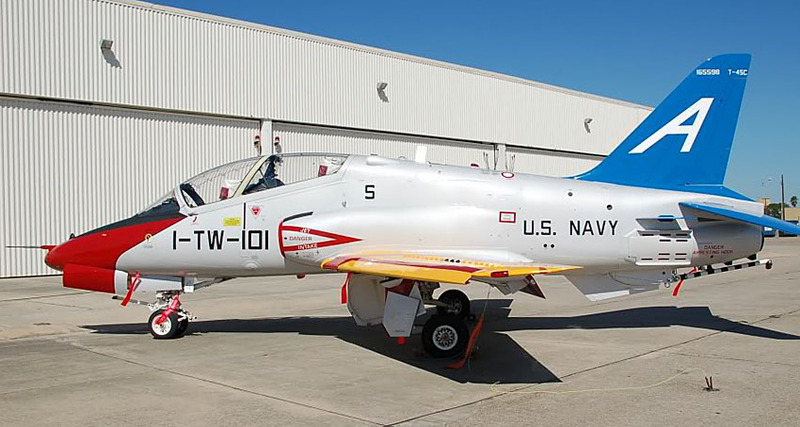 The Cartograf decals that include markings for six different aircraft. Optional build items include different side and engine cowls, plus fuselage and upper wing. 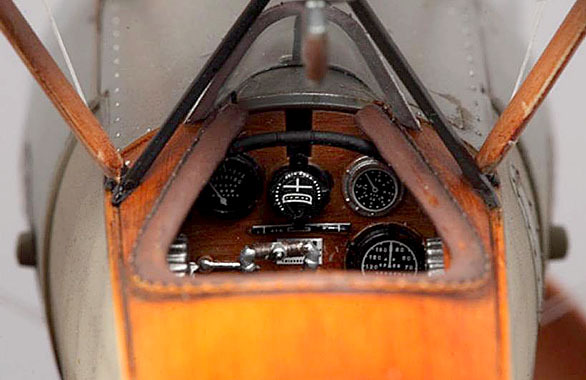 The LeRhone engine is a miniature masterpiece, while detail work throughout is good - just look at the sewn seams on the rear fuselage and the wood-effect around the cockpit. 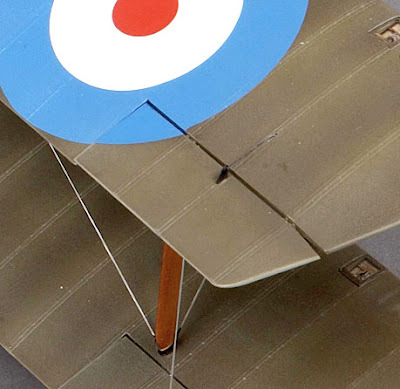 For the nimble-fingered model maker Wingnut provides a rigging diagram, and this of course sets the aircraft off a treat - in fact, it’s essential to make the best of a biplane to this large scale. In all, a highly recommended kit for the Great War enthusiast, and one that will sit realistically with any of the 54 mm military figure sets also available from Wingnut Wings. 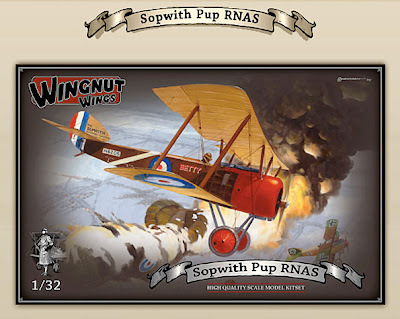 Sopwith Pups were used in pioneering carrier experiments. 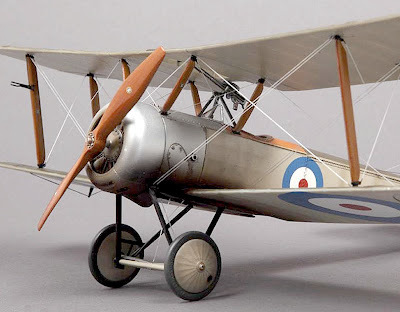 On 2 August 1917, a Pup flown by Sqn Cdr Edwin Dunning became the first aircraft to land on a moving ship, HMS Furious. Sadly, Dunning lost his life on the third landing, when the Pup went over the side into the water. Even so, the trials pointed the way to operational deployment, and a few months later Pups began carrier operations. At first, they were fitted with skids instead of wheels, using wires to trap the aircraft on landing. 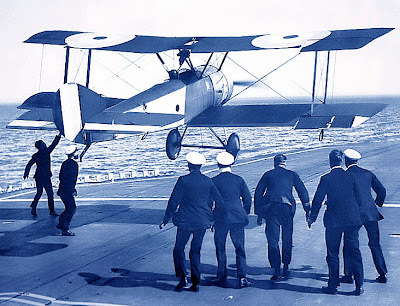 Later versions reverted to wheels, which made deck handling by ground crews easier. Visit the Sopwith Pup at Wingnut Wings, where there is masses of extra information to look at, here. 2-6 Views of the assembled Pup, courtesy Wingnut Wings. 7 Dunning makes flight trials on HMS Furious. 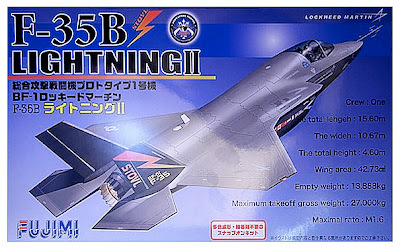 No sooner did we do the F-35 piece below, when we ran across the recent Fujimi 1:72 scale F-35B STOVL version. It’s a multi-colour kit, something along the lines of the old Matchbox releases, though it has to be said, Fujimi’s palette is far less alarming than the kaleidoscope of inappropriate shades that Matchbox dreamt up. It’s an important product, as it is about the first one that approximates the production-standard machine, though doubtless details will still change between now and squadron service. The engine is moulded in a rich dark metallic shade and has extremely fine detail, so top marks there Fujimi. Less entrancing are the weapons, which are fairly basic - serious model fans will go straight to the bits box or to aftermarket suppliers. 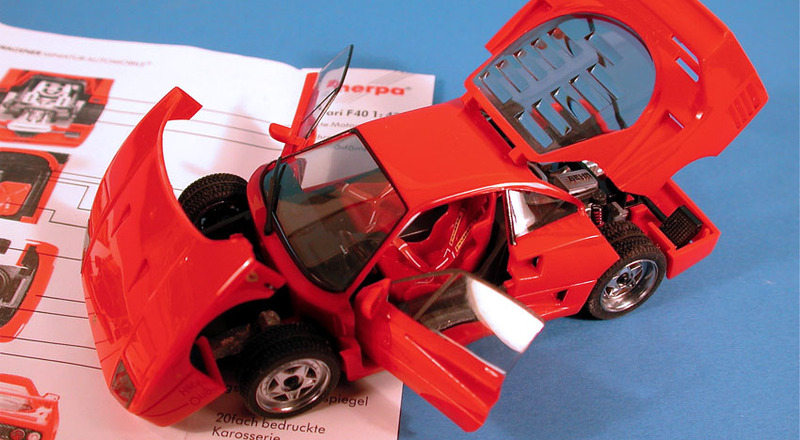 The Fujimi model is becoming available now, from model stores and online suppliers. There’s an in-depth review of what’s in the box, with heaps of closeups and comments for and against, from model maker Drewe Manton here. 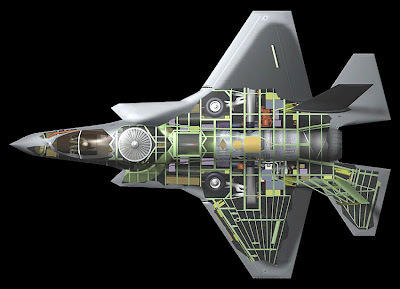 After years of development, and seemingly endless delays and price hikes, the ‘5th generation’ fighter jet from Lockheed Martin, the F-35 Lightning II, has at last been ordered into limited production. 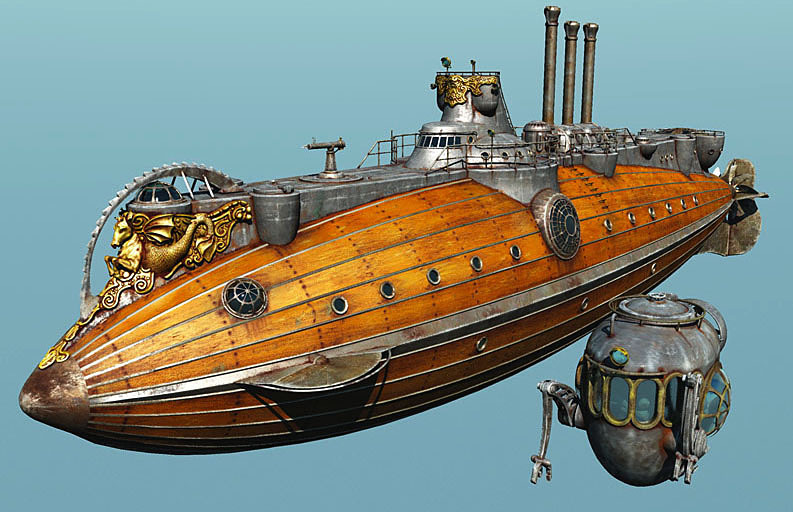 It’s a bit better than recent news that the UK has dropped the F-35 STOVL version in favour of a standard configuration for launching from its as-yet unbuilt Queen Elizabeth-class aircraft carrier. Along with other news that the UK Harrier force is being disbanded, it looks as though the UK is in for an entire decade without carrier-borne air power. Let’s hope it’s not needed. 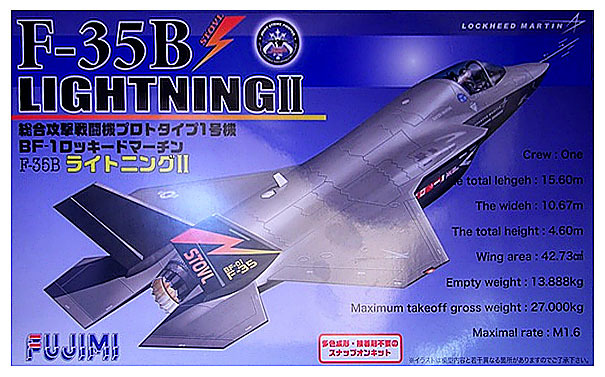 Back to the F-35: it’s not been a massive hit with the model companies yet, but the rumour mill indicates that things will improve in 2011, not least with a Lindberg version to 1:32 scale. That’ll be interesting if it happens. 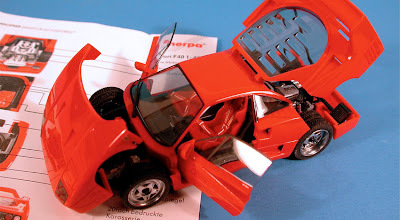 Meantime, apart from the old Italeri 1:72 and Panda Models 1:48 offerings there’s so much to wait for. Still, we couldn’t resist showing you the latest in ‘5G’ fighter helmets - Star Wars, eat your heart out, 5G pilots tote serious stuff! However, even if there isn’t yet a really good F-35 injection kit - and no sign of a production-standard machine - there are various radio control scale and semi-scale versions to build and fly. The video (without sounds on our system, but you may have better luck) shows one of the most aerobatic ones available. 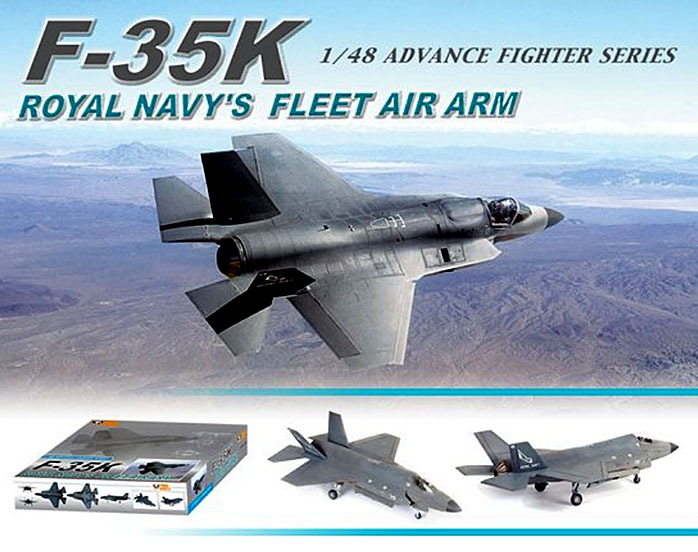 Visit one of the RC F-35 suppliers, Esprit Models here. 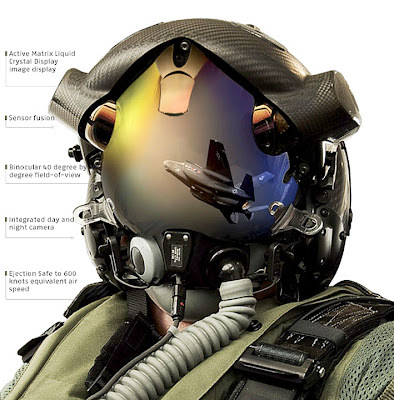 1 5G fighter pilot helmet. 2-3 Panda 1:48 scale kit. 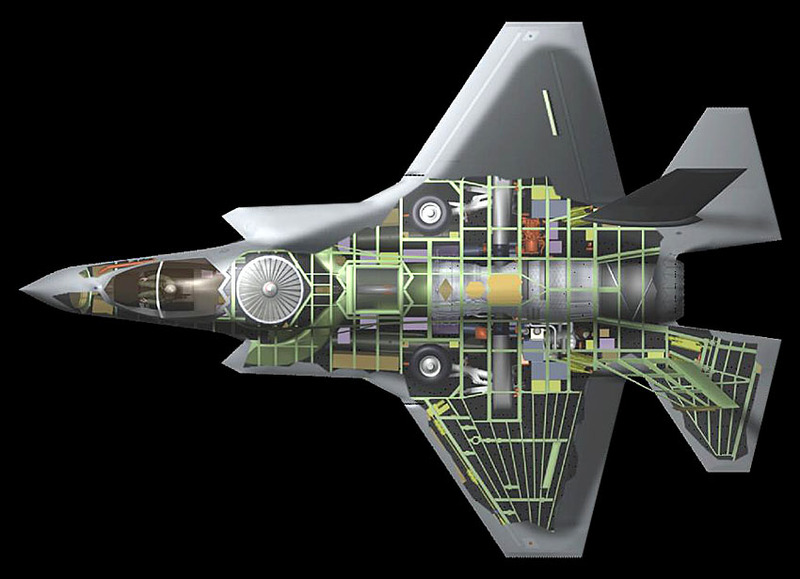 4 Cutaway plan of the F-35B, clearly showing the engine and front lift fan arrangement. To design-purists like us, this layout is not a patch on the Harrier’s elegantly simple four-poster exhaust system.